Xavier "Xavi" Hernández Creus ">[ˈʃaβi ərˈnandəz ˈkɾɛws] Spanish: [ˈtʃaβj erˈnandeθ ˈkɾeus]; born 25 January 1980) is a Spanish professional footballer who plays as a central midfielder for Qatari club Al Sadd SC. Xavi came through La Masia, the Barcelona youth academy, at the age of 11 and made his first-team debut against Mallorca in August 1998. Since then he has played 700 matches, scored 82 goals and made more than 180 assists for over 50 players. Xavi is the first player in Barcelona's history to play 150 international matches. Highly regarded for his humble persona and team ethos, Xavi is viewed as being the embodiment of the tiki-taka passing style of play, and is considered to be one of the greatest central midfielders of all time. He is also considered by many in the game to be the greatest Spanish player ever. * Senior club appearances and goals counted for the domestic league only and correct as of 10:57, 27 December 2016 (UTC). 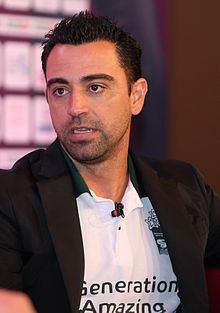 Xavier "Xavi" Hernández Creus ([ˈ(t)ʃaβi ərˈnandəz ˈkɾɛws] [ˈtʃaβj erˈnandeθ ˈkɾeus]; born 25 January 1980) is a Spanish professional footballer who plays as a central midfielder for Qatari club Al Sadd SC. Xavi came through La Masia, the Barcelona youth academy, at the age of 11 and made his first-team debut against Mallorca in August 1998. Since then he has played 700 matches, scored 82 goals and made more than 180 assists for over 50 players. Xavi is the first player in Barcelona's history to play 150 international matches. Highly regarded for his humble persona and team ethos, Xavi is viewed as being the embodiment of the tiki-taka passing style of play, and is considered to be one of the greatest central midfielders of all time. He is also considered by many in the game to be the greatest Spanish player ever. Xavi won 28 trophies, only surpassed by Andrés Iniesta as the most successful Spanish player in history. He came third in the 2009 FIFA World Player of the Year, followed by third place for its successor award, the FIFA Ballon d'Or, in 2010 and 2011. In 2011, he was runner up to Lionel Messi for the UEFA Best Player in Europe Award. He has been awarded the IFFHS World's Best Playmaker award for four years: 2008, 2009, 2010, 2011. Xavi has been included in the UEFA Team of the Year for five years (2008, 2009, 2010, 2011, 2012), and has been voted into the FIFA World XI on six occasions: 2008, 2009, 2010, 2011, 2012, 2013. At Euro 2012, with his two assists in the Final, Xavi became the first player to register assists in two separate Euro finals, having set up the lone goal in the Final four years earlier. He was awarded the Prince of Asturias Award for Sports in 2012.